Key skills: simulation modelling (especially forest ecosystem and natural disturbance modelling and carbon budget modelling), systems architecture and design. Sarah’s work focusses on helping others to understand and manage biological systems through simulation modelling and data management. She uses her analytical and biological background to create and use simulation models that cover a variety of issues and scales. While at ESSA, she has been the lead or co-developer for forest ecosystem dynamic models that include natural disturbances, management, and carbon dynamics. She has worked both at creating new models and developing additional functionality in existing models. Examples of her work include: various extensions to FVS (fire, carbon, root disease), the ForCS extension to Landis-II, and VDDT/TELSA. More recently, she has expanded her skills to include working with models or tools in the aquatic domain, and to helping to design and implement data management systems. 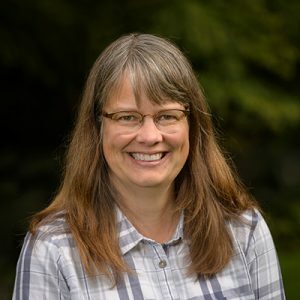 Sarah is a Registered Professional Biologist and Senior Systems Ecologist with over 25 years’ experience in ecological simulation modeling and analysis. She holds a B.A. in Mathematics and Biology from Kalamazoo College, and an M.Sc. in Zoology/Applied Mathematics from the University of British Columbia. Outside of work, Sarah spends time supporting her kids’ interests, including serving for four years on the Board at Westmont Montessori School, and spending hours volunteering her time with Island Swimming and PACE musical theatre. Sarah is also an avid change-bell ringer.